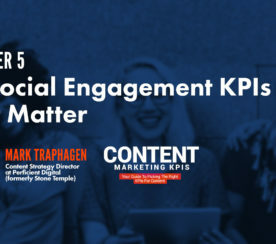 Are you looking to raise your engagement levels across all your social media platforms? With the continually changing algorithms on Facebook, Instagram and Twitter, getting higher social engagement can be increasingly difficult if you aren’t producing the right type of visuals. Across our research over the last couple of months, we have looked into what type of visual images on social media tend to get more social engagement and shares, over others. 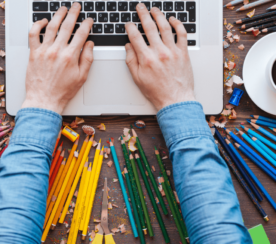 In this article, you will learn about the four types of visuals that will get the highest amount of engagement. Artistic illustrations are visuals that rely on vector-based illustrations. In the examples below, you’ll see artistic illustrations – simple drawings – that are a great complement to the content copy. Important: the colors must contrast with each other for the visual to truly stand out. 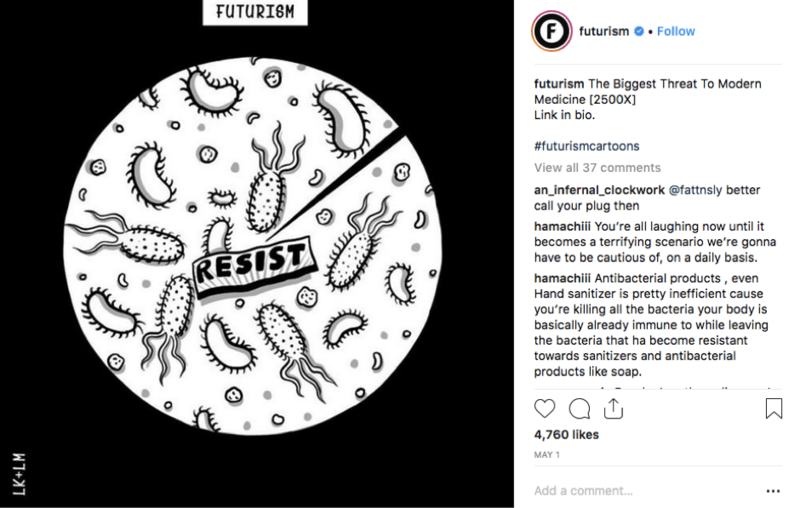 In this post, MIT Technology Review is trying to communicate a project about human cells being invulnerable to infection. The visual shows an illustration of a human cell with boxing gloves, seemingly pushing away the “bad cells” within this short animated visual. 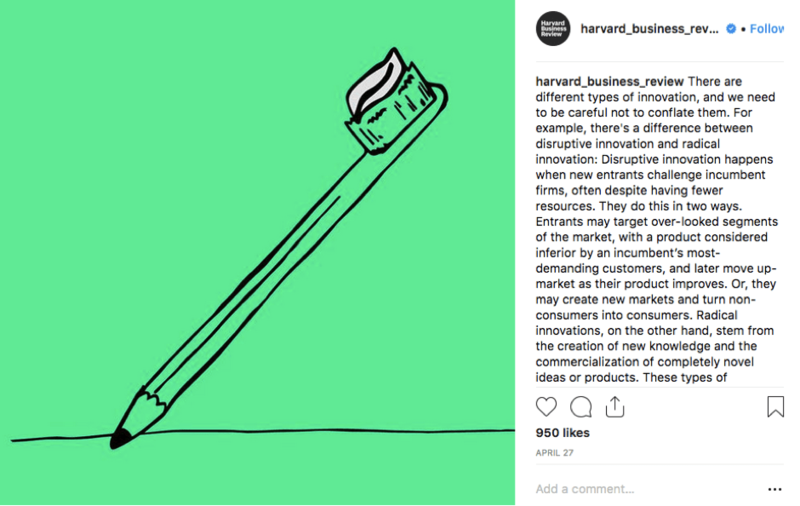 This post communicates the difference between disruptive innovation and radical innovation in the copy. But the visual complements the copy by showing an example of the gap with an illustrated visual of an object that is both a pencil and a toothbrush. 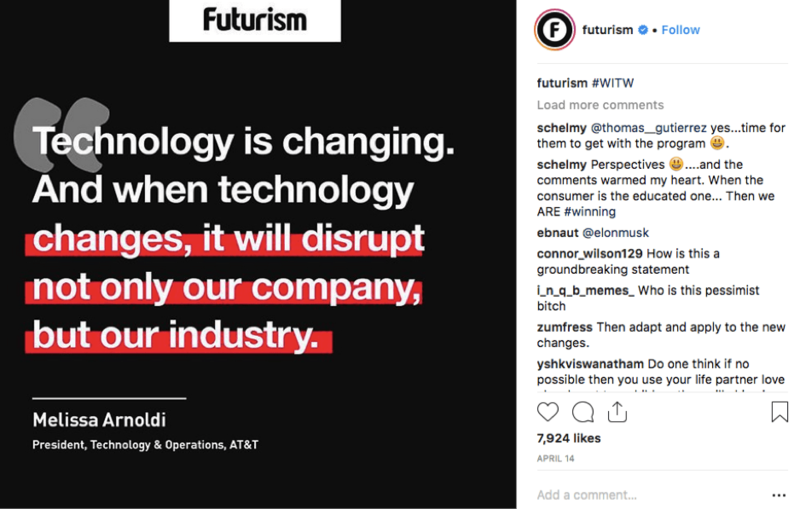 This post by Futurism has an intent of drawing curiosity from its audience. By looking at the visual, one might get a little more interested in what this content is all about. Statistics are a great way to keep your audience informed about any particular topic. But most brands are doing it wrong. 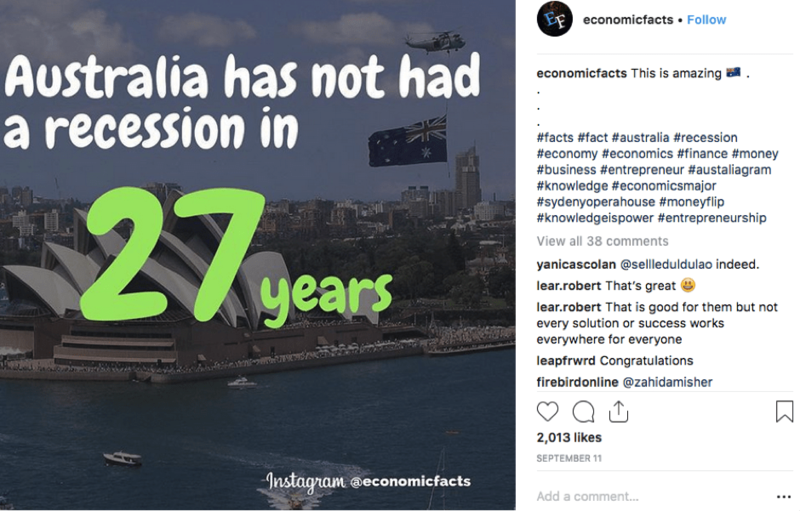 Because they’re using statistics in the form of visuals filled with text. When publishing content relating to statistics, you have to be more creative about how you intend to produce these visuals. 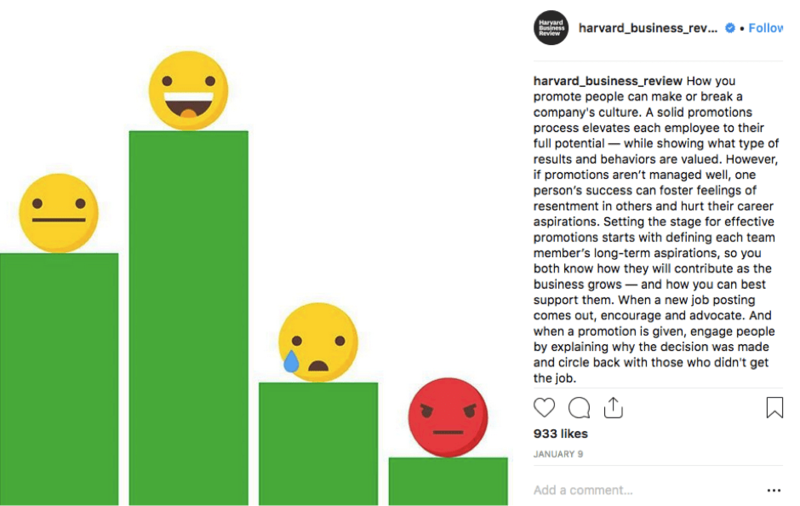 In this post, Harvard Business Review shows how a job promotion can potentially change employees’ perception of the company culture. The visual image is created based on research and survey on this topic. 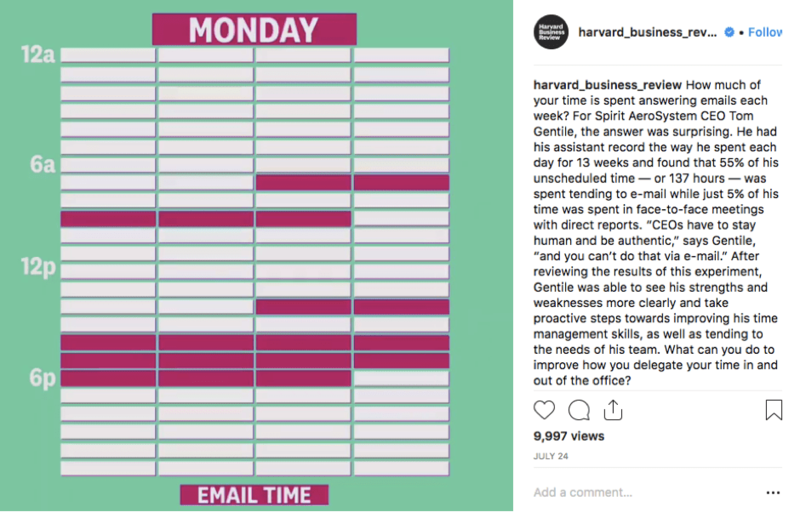 Since this post about a CEO’s study on how much time he has spent answering emails, the visual image was actually created based on the actual time he spent attending to his emails. Such visuals can communicate a great story. This post by International Space Station shows the number of spacewalks done between U.S. and Russian Spacesuits. 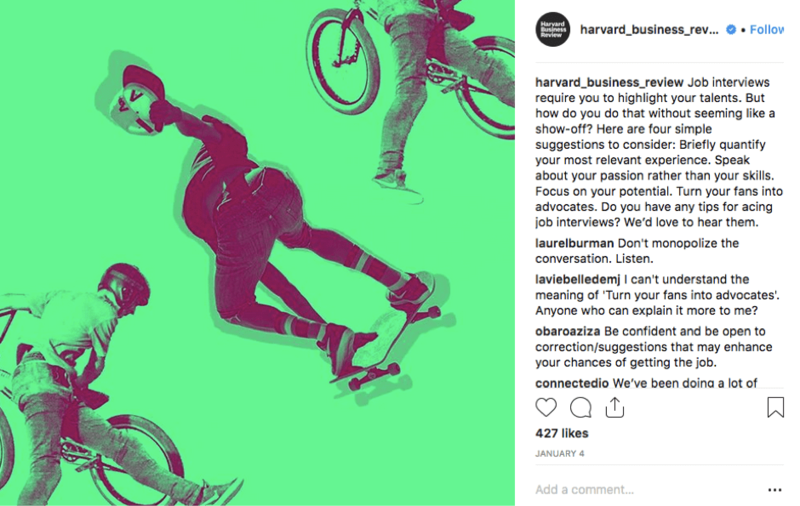 Brands have been creating social media posts based on quotes because the marketers behind these brands know that such content typically earns a decent amount of engagement. However, such types of materials have been overly used, and they no longer can get high engagement levels anymore. 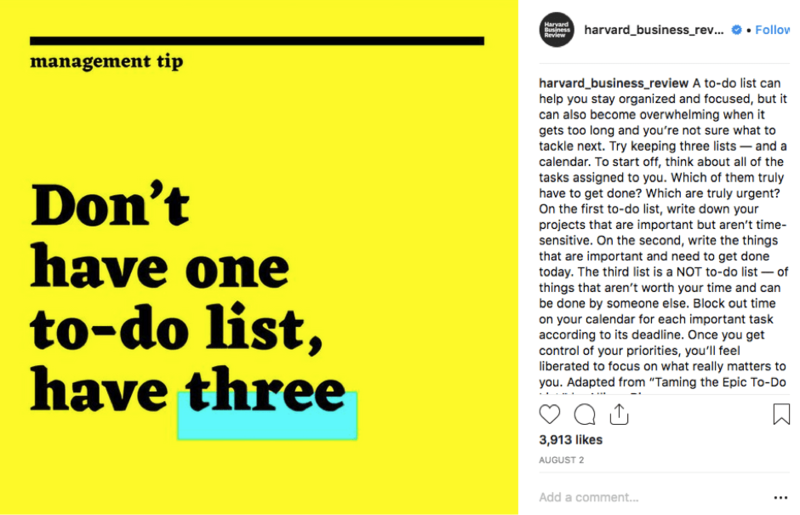 If you intend to create such posts, there are ways to design it so that you can still make exciting content around quotes. The trick is to develop them creatively by playing around with colors, patterns, and typography. This post was about Australia, so the background image was the Opera House, an iconic tourist spot within the country. The font sizes and colors used in them were intentionally tweaked to show how the country has progressed economically. This visual image is based on a quote. The highlighted text in red also emphasizes another point that the quote was trying to communicate. 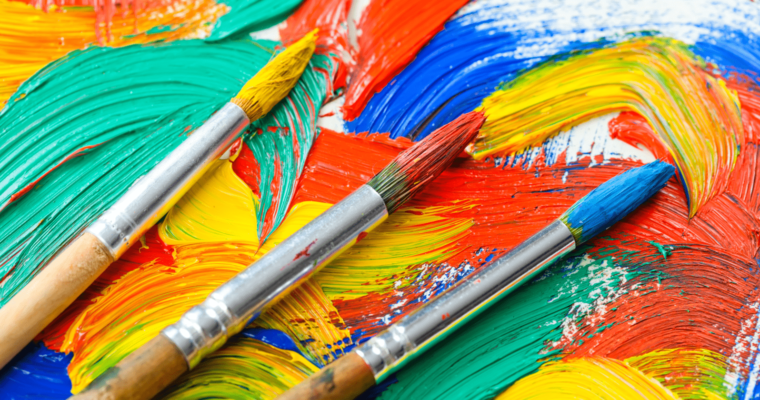 The colors used in this visual are not only contrasting with each other, but they help to make your content truly stand out in your audience’s news feed. Yes, we know posting well-taken photos are another way of getting high social engagements. But what if we don’t have excellent photography skills? This is where filtered photography comes as a great help. By using a pink filter in this photo, the visual can now stand out on its own despite a picture that may not be professionally shot. Here’s another visual that was created based on putting a few photos together, and adding some layers and borders around it. Again, the colors used as filters were intentionally selected so that the visual will stand out in news feeds. Now you know the four types of visuals that can draw higher social media engagement for your brand. So how do you actually go about creating them? Here are three tools that can help you. Canva is one of my personal favorite tools. With Canva, you can easily create social media posts for any platform with their preset image sizes. However, like any software, Canva has its own set of limitations as well. When creating posts based on quotes, Stencil is a useful tool to explore. You can use its simple image creation tool to quickly get any quote published on your social media profiles within a few minutes. Trying to get more creative with some statistics? The tool is intuitive enough to help you communicate across the statistics and data visually. Creating vivid visuals like these may come across as a lot of hard work, but the aforementioned tools can do a lot of the heavy lifting for you. So have fun with them, and be sure to measure over time what types of visual tend to do better with your audience.